La Hacienda is a divey-looking pizza joint, bar, and Italian restaurant in Somerville. It's a stone's throw from where I grew up in East Cambridge, but it was not until recently that I even realized that it was an Italian restaurant, not Mexican. You enter through a heavy wooden door in to a dark room filled with high-backed wooden booths and a bar stretching along the left side. The prices are extremely affordable; the entrees range from $13-$18. We started with the Italian salad ($9.5). It was a large plate of quartered firm tomatoes, roasted red peppers, marinated mushrooms, black olives, (all courtesy of a jar or can) and a julienne of deli-sliced mozzarella. It was sitting in a pool of sweet vinaigrette. 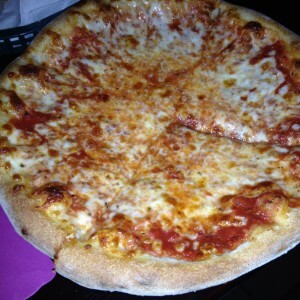 My friend Christine recommended the pizza, so I got an individual sized cheese ($7.5). It was excellent. The crust was thin and a perfect balance between crisp, tender and flavorful. 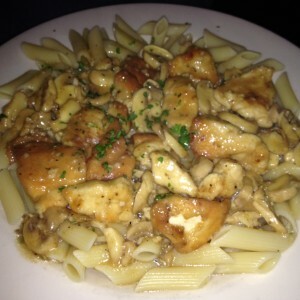 Steve's chicken marsala ($14) came with a generous quantity of ziti. The pasta was a tad over cooked, but the sauce was tasty and the chicken was tender. There was enough for his dinner and lunch the next day. Steve also had a glass of cab ($7) and he was pleased with it. Our server was friendly and I loved the sliced scali bread they bring at the beginning of the meal. Steve really liked the restaurant – he felt that it was "good, honest food at reasonable prices,"